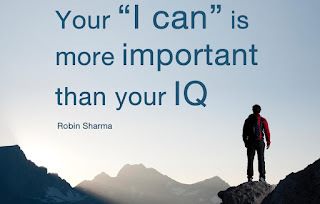 }); relaxed and healthy: Motivation- "I Can"
There are times when we are face with difficult task or situations and our first thought is " I can't". "I can't" start a new career, "I can't" do this on my own, etc. Yes, at times the light at the end of the tunnel is hidden from us because we haven't yet work out the road map to getting there. "Limitations exist only because you let them" meaning if you put limits on what you can do, then you will never learn or experience your true potential. To truly triumph over difficult situations or challenges you must have an open mind and a "I Can" mentality. It doesn't matter if you fail on your first or hundredth try what matters is that you gave it your all every single time. If you want something bad enough you will have to work hard and even suffer a little to achieve it. Do not make the mistake of not stepping out of your comfort zone because of fear, fear will have you staying in the same place for far too long. Just know that a lot of good things that have happened in our lives are in some ways shape by difficult situations or times. So everytime you push through a difficult time or difficult situation give yourself a high five or a pat on the back for a job well done. Just know that changing your tune from "I can't" into "I Can" will have you saying " I Did it". I love this post! We tend to forget about these things, but they are very important! Thanks Nerline! you are so right, sometimes we lose our zest.